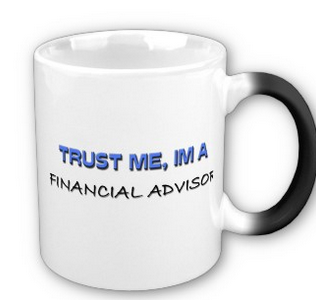 asked for help with some financial advice. I was given three names. None of the firms had the personal contact details of their team on the website. Two people had Linked In profiles I could connect with – but of course, until they connect back to you it’s not possible to see their contact details. I was left with the website telephone number as the only way to get in touch. Please would you all make it plain and easy for me to get in touch with the named person? Surely each person wants to get in direct contact so they can start a discussion with minimal delay? Cluetrain has New Clues – time for newbies to read the original! I listened to the FIR podcast #790 and found that Cluetrain has been updated! You want to know what to buy? The business that makes an object of desire is now the worst source of information about it. The best source is all of us. It will be hard to adhere to them – because marketers are busy fouling their own nest, much as we did with banner adverts, SEO and oh-so-many other internet tools which we over-exploited so the makers ended up changing the rules to exclude our actions. Seems to me ever more of a message about the quality of content, ease of discovery and honesty of presentation. If your marketing strategy for this year even remotely resembles what you did for the past 5 years tear it up. Forget it. The businesses who will thrive understand Cluetrain, they present their wares at least in part in a Cluetrain-format and will reap the $$ rewards accordingly. Just call us if you think you want to change and don’t know how. I’m going to get my whole team to read Cluetrain original next week as their homework! https://creativeagencysecrets.com/wp-content/uploads/2009/06/cluetrain.png 205 139 Rebecca Caroe https://creativeagencysecrets.com/wp-content/uploads/2014/04/CAS_Logo_1line_RGB.jpg Rebecca Caroe2015-01-27 11:29:392015-01-27 11:29:39Cluetrain has New Clues - time for newbies to read the original! It’s difficult – I know what I want from you when I send a cold email, but it is very hard to get you to respond. Here’s a great tip – don’t ask for what you want. Yes, seriously, don’t. I know this sounds counter-intuitive, but trust me, I’m going to show you an insider’s trick. So what do I ask for in a cold email? Start with offering something for the recipient. 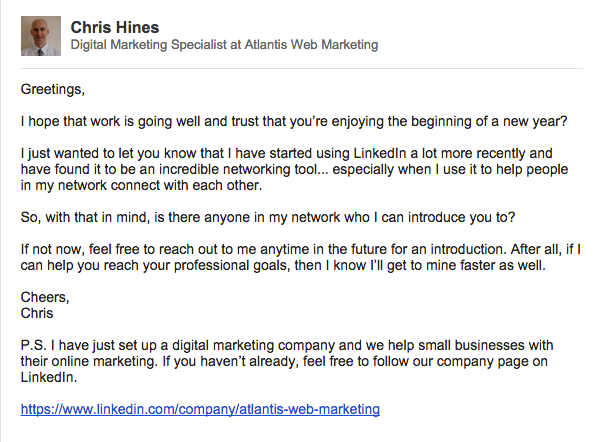 Take a read of this example from Chris Hines. Do you see how Chris leaves you in no doubt about what he wants (it’s in the P.S.) but because he starts by offering me something I would value, when I get to reading the last lines my frame of mind is set to take up his offer. The Principle of Reciprocity is a fundamental human value found in most societies, Chris uses this because he offers me a service (introducing me to his contacts) first knowing that when I get to reading the PS I will interpret it as a reciprocal requirement to complement his offer of service. Now, can you use this in your business? 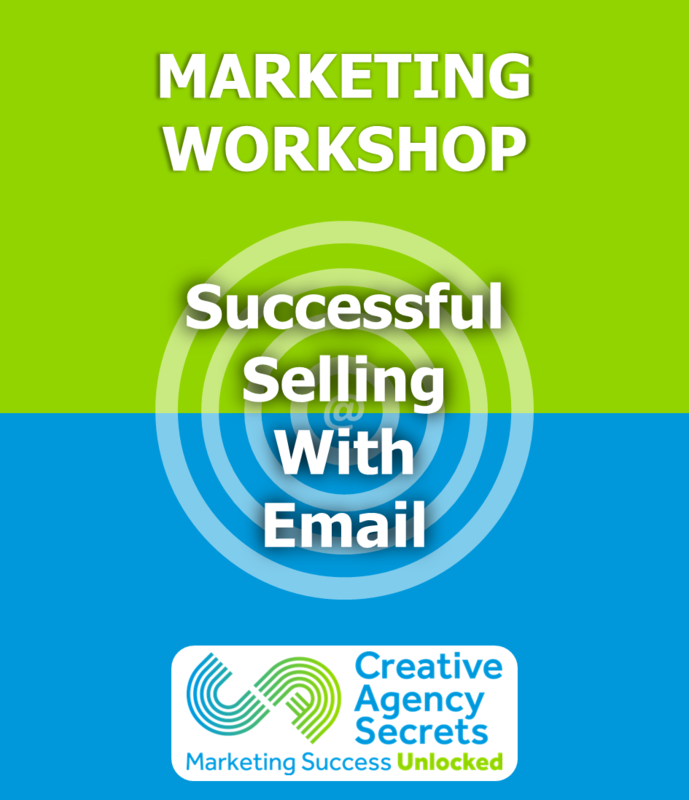 Buy a Workshop on how to use email for your business marketing. I’m a digital abstract New Zealand artist. I do paintings in digital form then get them printed onto canvas. I’m trying to look for an Art Manager or Art Agent to help me to promote and sell my art. Do you know of anyone that will be able to help me grow my business? if you want representation, you have to go and meet people and show them your work. There’s no substitute for face to face personal contact. have a newsletter or blog where you can publish your latest works and email these out to your mailing list. If you don’t have one yet, start to collect the email addresses of everyone you meet who could either buy your work or may know someone who could buy it. Send them messages regularly. Good luck and I hope you succeed. The blue icons opposite are part of our 8-Step New Business Development Methodology. 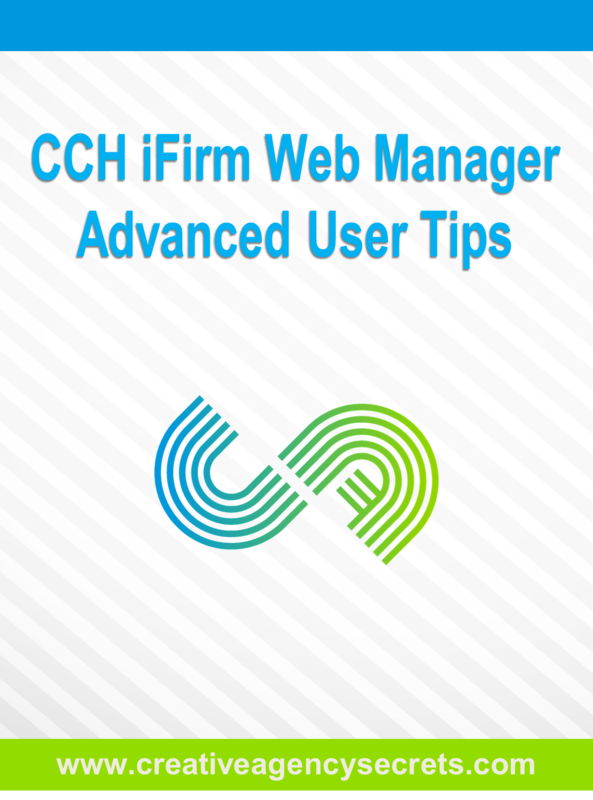 Throughout our marketing activities with a number of accounting firms, we’ve become quite proficient in using the CCH iFirm Web Manager. So we’ve bundled all our best Advanced User Tips into one easy eBook. If you are not confident using HTML (hyper text mark-up language) – the programming language behind most websites – then don’t worry. This book helps you to set up the website using clear screen shot photographs and step by step instructions which you can follow without knowing any HTML code. Read this book if your website doesn’t look the way you want it or if it does not function the way you need. Chances are there’s a method we have discovered that will help you round your impasse. And if there isn’t you can always get in touch with us to ask if we’ve discovered something new since we published this book in December 2014. Setting up & using RSS feeds. 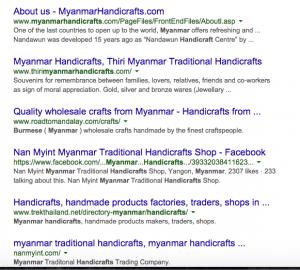 Creating a Site Map so Google indexes your Blog and Website. Embedding YouTube videos into your pages & posts. Creative Agency Secrets are experts in accountancy firm marketing. We can tutor you and teach you what to do if you want to do the marketing yourself. Or we can do the firm’s marketing for you. 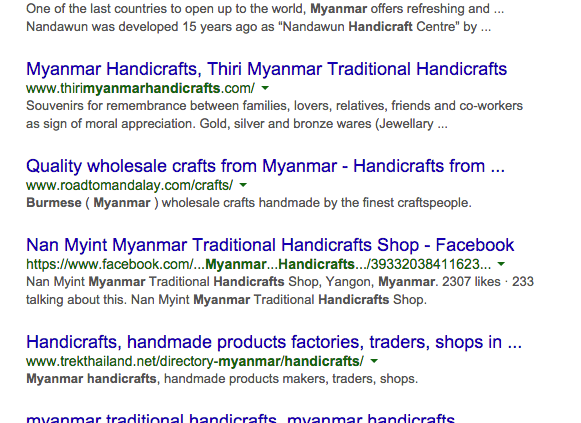 They sell to both tourists and local Burmese customers. The main challenge here for the women is that they are a disparate group and so clubbing together to make a single selling organisation who can take on the marketing and promotion to a range of distribution channels (web and retail shops mainly) is probably the best use of their time. 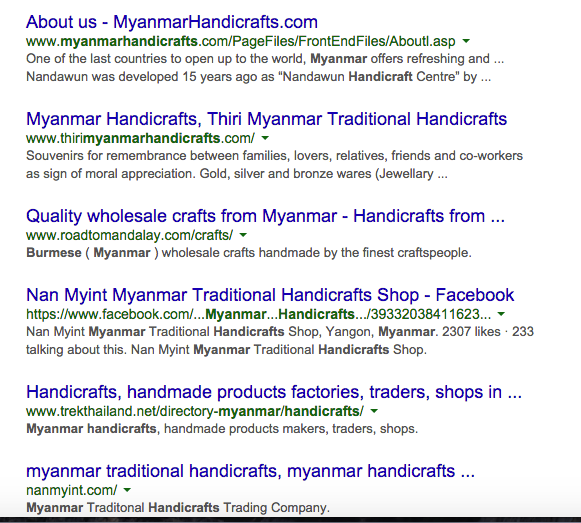 I did a search result for the words “Myanmar Handicrafts” and it’s clear there are plenty of existing online shops selling in this category as well as Facebook pages – which is good for international sales in the English language. Get samples of their sewing work. Take photographs of each lady who made the product. Contact each of these websites and send them two photos of the women and their sewing. Ask if they would like to sell your products in their shop. After 1 week if they do not reply by email, telephone them. If you can, ask to visit each shop owner with a bigger selection of sewing for them to look at and then face to face discuss if they will buy from you. The basic method is to bring awareness of your product set to people who already have an audience of customers – this B2B route to market is faster than trying to build up your own audience of prospects. But by getting face to face with retailers I think this group of village women will stand a good chance of finding outlets for their work. Downstream it may be worthwhile finding charities like Oxfam, Unicef and Save the Children to see if they’ll buy product for their online and catalogue business. This week has been spent writing direct response emails for client campaigns. And so it was delightful to receive one which has a really awesome subject line. You may want to emulate it. What a timely question! This week I am doing the business planning for Creative Agency secrets during 2015. And so yes, the beginnings of my 2015 lead generation is now in place. But it may not be for you! Subject: You can run your business the way you always have…. The last one is particularly effective for getting decisions from prospects and pushing them into buying. Do you need help writing direct response emails? Download our e-book on Writing direct response emails. It covers a range of scenarios from cold emails to driving sales and includes samples which you can use and adapt. Below you’ll find the full text of Mark’s email and the event he and David Baker are promoting. Any start up info for a new business opening – a juice bar in a tourist area in Tenerife. Strong branding and excellent signage around your shop. Offer a discount to anyone who likes you on Facebook when you launch…. get them to show you their smartphone page like before they pay. This will get you a crowd to kick off as fans. Do joint promotions with other complimentary local businesses – they send you their customers and you reciprocate. Which days of the week are quiet? Or which times of the day? Do a guy 2 get one free offer before 11 am or on Mondays. All the things I’ve suggested fit into Step 4 Profile Raising of our New Business Development Methodology. Read other blog posts in that category for more ideas.